A Dodge Dakota pickup truck crossed the median into an ongoing semi heading westbound on U.S. 30, causing two fatalities, near Delphos. 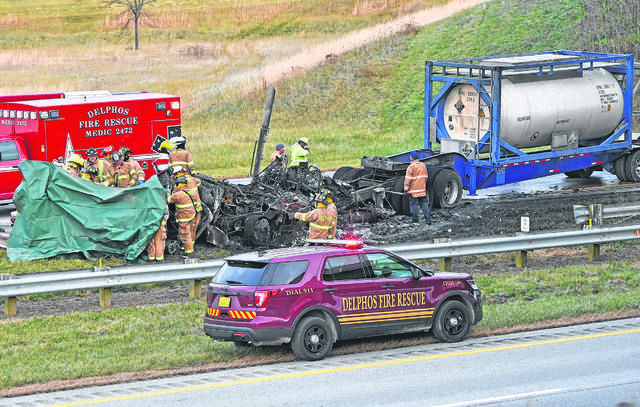 DELPHOS — The identities of the people who died have been released in a double fatal accident from Tuesday on U.S. 30 near Delphos. According to the Ohio State Highway Patrol, Lima post, just before 3 p.m., a 2003 Dodge Dakota, driven by James M. Patterson, 36, of Van Wert, was eastbound on U.S. 30, when he lost control, traveled through the median and into the westbound lanes, hitting a 2019 Peterbilt Tractor, driven by William D. Wolfe, 79, of West Cliffe, Colorado. The collision caused the pickup truck to catch fire. Patterson, along with a passenger, Jeremy A. Shults, 30, of Van Wert, were killed in the crash and pronounced dead at the scene by a representative from the Allen County Coroner’s Office. Wolfe and his passenger, Linda M. Rinda-Wolfe, 61, were taken to Mercy Health-St. Rita’s Medical Center, where they were treated for minor injuries and released. The commercial trailer was hauling sulfuric acid, a hazardous material, but the tanker did not leak.